+ What do you like more or less about reading a children's book as compared to adult fiction? + What did you like or dislike about Roald Dahl's writing style? + Were the characters over the top to you or did that not matter to you? Did you have trouble "buying" the story? + Did the story seem too grim or dark for children? I LOVED reading Matilda this month. It felt so light and easy and I guess that is kind of what I needed for this first month of summer. When I was a little girl I read all of Roald Dahl's books- he was one of my favorites. It's crazy to revisit a book 15 years later and rediscover why you loved it so much the first time. In a way it was kind of magical for me to reread this book and to fall in love all over again with a book and an author that made me fall in love with reading in the first place. One thing I love about children's books is how fast they read- give yourself two hours and you will have downed Matilda in its entirety. Both of my older sisters are so good about reading with their children, and reading Matilda this month made me really excited for the day when I can read books with my kids. It's such a great story for children who are just diving into chapter books, and I think it captures the magic of reading. Such a great book to instill a love for reading. The main thing that normally turns me off to a book or an author is if I don't relate to the characters or I don't think the characters are believable. This, however, didn't bother me at all in Matilda. The majority of the characters are somewhat ludicrous- the mother who plays bingo all day, the dad who puts sawdust in the engines of the car he sells, the terrible Ms. Trunchbull who throws children by their pigtails. All characters are totally over the top and unbelievable. (The principal for sure would be fired within days!) And then you have the opposite- the characters who are all good. The darling Ms. Honey who is so sweet and perfect; Matilda, the angel who can read and understand whole novels at the age of four... Usually I roll my eyes at characters like this. But not in this book. I think the reason I didn't mind that the characters were so over the top in Matilda is the fact that it's a children's book, and I saw it as a portrayal of the characters from a child's viewpoint. To a kid of four or five, everyone is either all bad or all good. The kids don't understand nuances or subtleties yet- there is no understanding for or reasoning behind why the bad characters do what they do, and the good characters have no flaws whatsoever. This black and white portrayal of the characters reflects children's understanding of people. I don't think we understand the complexities of people until we are much older (and even then, many adults still prefer to see people as all bad or all good). Because of that, I loved how terribly evil Mrs. Trunchbull and the parents were portrayed. Of course they were that evil, this is the story about a five year old girl and in her mind people can be that cruel and unrelenting. On the flip side, people can be so good that they border on saints- like Ms. Honey. I don't have kids yet and my standards might be a bit different when I do, but I don't mind the darkness in the book at all. Yes, the principal is locking kids in a standing-only-with-spikes-all-over closet, but to me it doesn't touch anything that would make me seriously concerned for a child reading it. I am interested what moms think, though- would you feel comfortable reading this to your six or eight year old? Leave your comments below! If you wrote your own post for Matilda, make sure to leave the link and I'll do my darndest to read all posts and respond to all comments. Even if it's been years since you read Matilda or you only saw the movie, you can still comment! I loved Matilda when I was a kid. I actually read it to my mom when I was around 6. . .so I don't think it's too dark for kids at all. I'm not a mother (just have nieces) but it's crazy to contrast the current trend of kid insulation with how I grew up. I've seen some of the kids shows these days, and it's all slapstick/very obvious humor. Kiddies need to learn some verbal wit sometime. End rant. I didn't like the movie adaptation nearly as much, though I remember being excited about it. The live action approach just made it kind of weird - I wish it had been animated. 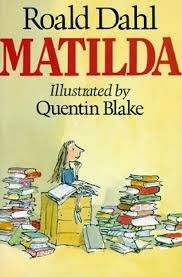 I love Roald Dahl's books, especially Matilda. I also think that the movie is fairly different than the book, almost stand alone. If that makes sense. But the book still trumps it. This was such a fun pick for the month! I like that you saw it as lacking nuance because it was written from a child's perspective. It's an interesting take. I think the unbelievable caricatures are hysterical! I would like to see the movie again, because it clearly had some different interpretations and even scenes we don't find in the book (if my memory serves me correctly). Thanks again for hosting book club! I think your character description was spot on. I also felt like the extreme bad or extreme good and wild descriptions were meant to be from a child's point of view. Matlida certainly DID spark a love for reading in me and a desire to read some of the classics I've never read! This book is so awesome! There is also a musical of Matilda and I've heard it's wonderful and magical. I really want to go to NYC and see it! Matilda is part of our 4th grade curriculum at school and I love it! This was the first year we could teach it and my students were just absolutely obsessed. Interestingly, I got a lot of pushback from parents when I showed the movie...several of them read online reviews that painted the story in a very dark way, but I didn't think it was that big of a deal. Sure, if you take it literally, it has themes of child abuse and neglect, but I don't think Dahl intended it to be dark. Maybe I'll think differently when I'm a parent...?